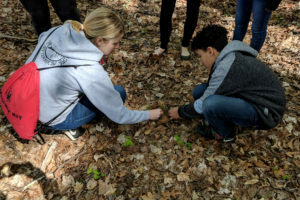 WAKE FOREST, N.C. ― Inspired by their Students Discover: eMammal project, Kenan Fellows Program alumni Rachael Polmanteer and Lena Deskins built on their citizen science experience by organizing a statewide schoolyard NC BioBlitz on Friday, April 20, 2018. 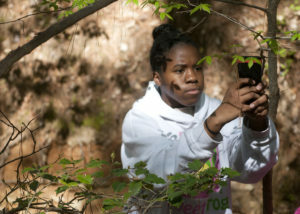 The event, which focuses on discovering, identifying and documenting as many living species as possible in a specific area over a certain amount of time, gave hundreds of students the chance to explore the biodiversity of North Carolina’s K-12 campuses. Polmanteer learned about BioBlitz events when she presented at and attended the Citizen Science Association conference in Minnesota last year. She said it is difficult to determine how many students and schools participated in NC BioBlitz across the state. At Wake Forest Middle School, where she teaches eighth-grade science, more than 400 students took part in the one-day event. 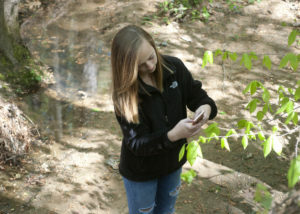 Armed with smartphones, the students scoured the woods behind the football field searching for wildlife, plants and any evidence of life including turtle shells, animal tracks and more. They used special macro lenses, purchased through a Bright Ideas grant Polmanteer received, to take pictures of whatever they could find. They noted the location of their findings, shared their observations and uploaded their discoveries to the iNaturalist app. Polmanteer and Deskins met in 2016 as Kenan Fellows working together to create instructional resources for Students Discover: eMammal. They see NC BioBlitz as an extension of their work through eMammal in which students survey and analyze the mammal biodiversity in and around schoolyards using cameras. At first, Polmanteer planned only to conduct BioBlitz just at her school. But Deskins, who is an academically and intellectually gifted teacher at Sandy Ridge Visual and Performing Arts Elementary School in Durham, encouraged Polmanteer to reach out to teachers across the state. Together they promoted NC BioBlitz to other educators while presenting at various conferences including the NC Science Teachers’ Association Professional Development Institute in October 2017. To learn more about NC BioBlitz, visit www.tinyurl.com/NCBlitz.